← Meet The New G.M. Tuesday was the big coming out party for the new Caps front office team. 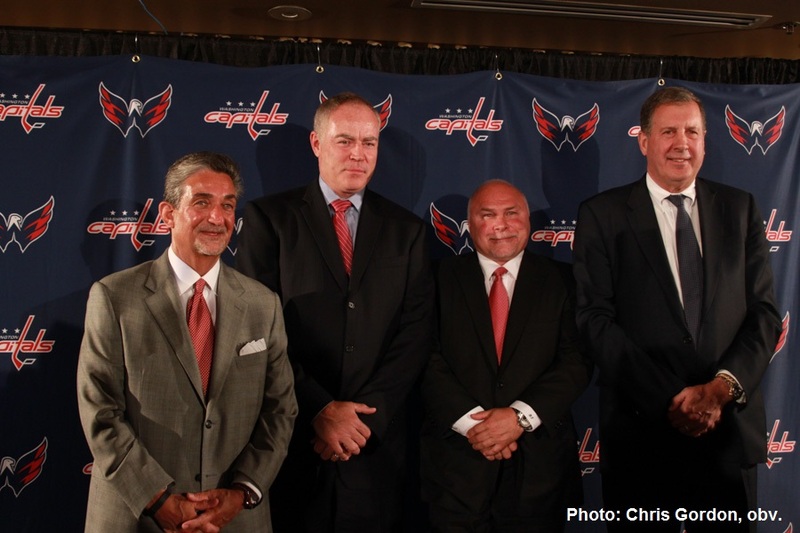 New bench boss, Barry Trotz, and newish GM Brian MacLellan, met the media at a noon presser at Verizon. We wanted to contribute to the discussion beyond the initial Monday evening twitter bursts of “Trotz is a good move” and “WTF, GMGMJr?” We couldn’t make it to the Tuesday cattle call, so we did the next best thing, we got a sharpie in Nashville to weigh in on the new coach. If you don’t know J.R. Lind, you’re doing hockey, twitter and life wrong. He was good enough to take the time to do a Q&A with us..
PB: How long have you covered the Preds? You cover other sports – what is it about hockey writing that you value most? What else do we (and Caps fans) need to know about you? JRL: Professionally, I’ve covered the Predators either on the business or on-ice side since 2010. I enjoy hockey writing — particularly as someone writing in Nashville — because there are fewer rules or preconceived notions about what a hockey story should look like. I can compare line-up decisions to 19th century theories of the nation-state, for example, in a way that would be dismissed pretty quickly if I was writing about college football. The rise of analytics has been interesting, too. For the NashvillePost, I’m writing to an audience that is primarily business leaders and, even if they don’t know much about hockey generally or Corsi or Fenwick or PDO specifically, that kind of information is something they value. Caps fans should know that, for a few years before the Predators came to town, I was a Caps fan (I loved Calle Johansson). 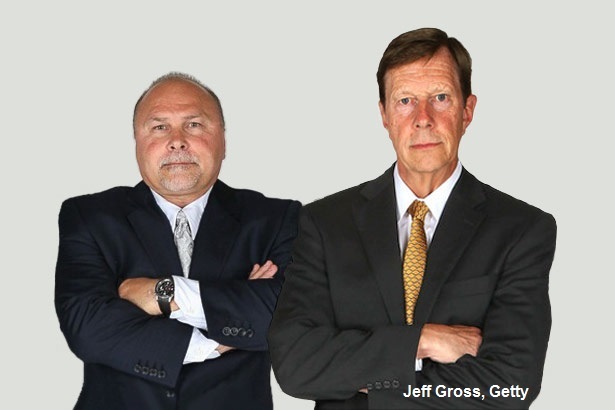 PB: What did you think the GMGM / Boudreau-Hunter-Oates shortcomings were? JRL: There was a pretty serious win-now sort of mentality in Washington, which isn’t terrible, but can become scattershot if it gets too desperate. Certainly, trading Filip Forsberg for Marty Erat and Michael Latta smacks of a front-office that was making changes for the sake of making a change. Not that Nashville minds, of course. On the coaching side, I never got the impression the staff — Oates and Hunter particularly — had a great feel for what kind of team they were dealing with and did far too much hoping the Caps would fit into a mold they were ill-suited for. PBs: How would you characterize Trotz’ relationship with the media? How did he and Preds media relations approach bloggers? 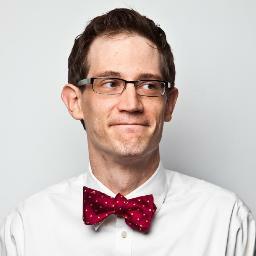 Does he go beyond the canned soundbyte with the press and how did he handle criticism? JRL: It’d be hard to find a mainstream media person or a blogger who would complain about how Barry Trotz dealt with us day-in and day-out. There would be days were I’d find myself talking hockey with him 30 or 45 minutes after his official availability was over. Having been here since the beginning, he took his job of educating Nashville about hockey very seriously. And he almost never short-changed you on answers. I talked to him at length for a piece I did for the Nashville Scene on Seth Jones and a question about what it was like to have a 19-year-old in the locker room (which almost never happens in Nashville) turned into a 20 minute answer about the philosophy of the Predators, going back to 1998. It was so good, so insightful, I regret that I didn’t get to use much of it. His general response to criticism reflected his tendency to want to educate. He wouldn’t argue with criticism so much as try to explain why he was doing things he was doing. He never treated bloggers any differently than he did mainstreamers and in part that’s because there aren’t many MSM guys who are exclusively on the Preds beat. Really, just Josh Cooper at The Tennessean is the only guy who does nothing but the Preds in this town, so there’s very little distinction drawn by the team between beaties and bloggers. PBs: How do you explain his longevity as Preds bench boss? JRL: In large part, it’s because Nashville as a sports town is still very much informed by the experience of college sports. In college — and particularly here in the South — coaches are gods and coaches are the ones who stay forever, because player turnover in college is part of the deal. And in part, it’s because a large cross-section of the media in Nashville are hockey neophytes who felt uncomfortable, perhaps, questioning a guy who knew miles more about hockey than we ever will. The Southern tendency towards deference probably had a lot to do with it, as well. He got a pass for a long time — rightly so, it should be noted — for having to coach an expansion team and then a team that was perpetually in danger of moving. That he was able to have any success at all was miraculous. Nashville was pretty content to go to the playoffs every year, even if there was no success in the post-season. He was able to get two playoff wins and that was seen as a step in the right direction, though in hindsight, it was the peak of the mountain. PBs: How would you characterize his relationship with Poile? JRL: A lot of people automatically think they were always simpatico, because they’d been together so long, but there were signs that they weren’t always on the same page, particularly in the last few years. David Poile kept picking up pugilists (Brian McGrattan, for example) who Trotz would play for 10 or 15 games early in the year and then primarily stash in the press box. The shine really came off this last summer when Poile decided to fire Trotz’s long-time assistant Peter Horachek was fired (by phone!). Phil Housley did well as an assistant (the Predators power play spent much of the year in the Top 10, bizarre as that seems), but the decision to fire Horachek was the first real public sign that the Trotz-Poile relationship wasn’t as rosy as we’d been led to believe. PBs: Caps fans have been highly critical of the past few coaches. 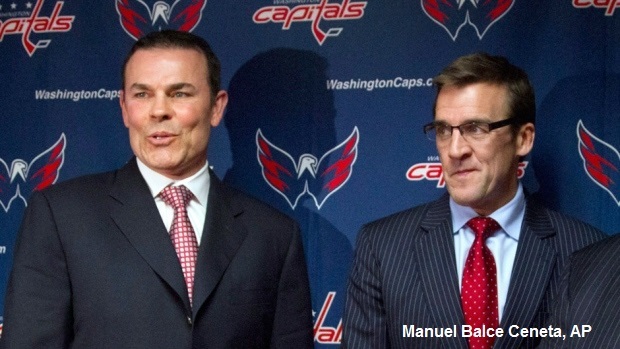 Maybe Ovi isn’t the “coach killer,” but we are. What was the rank and file fans’ opinion of Trotz? 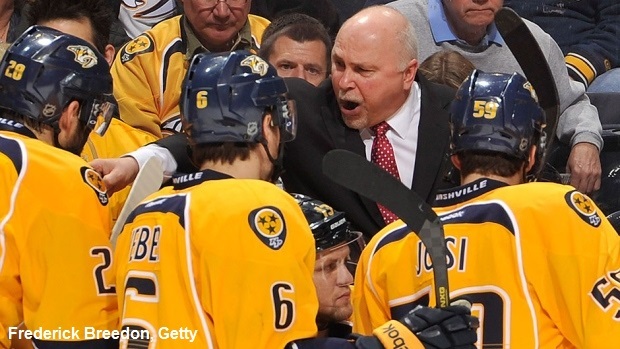 LRL: By and large, people in Nashville are grateful for what Trotz did here. He was all we knew and there’s no good way to express what that meant to the city as a hockey town. That said, two disappointing seasons that were emblematic of the oft-leveled criticism that his teams couldn’t score harmed his standing. 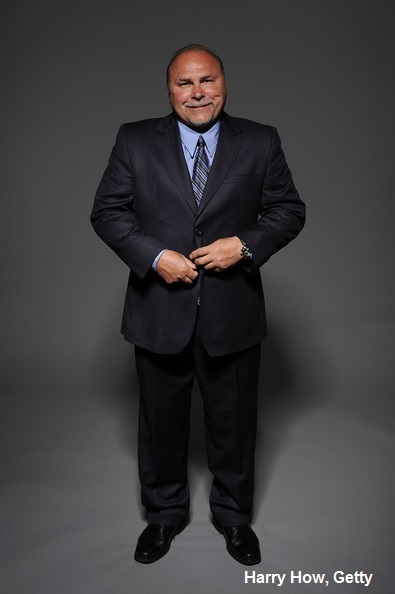 The reaction to his firing, however, has been positive in that people recognize both that a change was needed and that Trotz did miles of good here. If he gets the chance to be involved in the community and with the fans — and certainly that’s harder in a bigger market like Washington than it is in Nashville — people will fall hard for him. PBs: Much has been written about how Trotz may be able to fortify the Caps D, given the nature of the Preds squad and system. Do you put much weight in that? JRL: Certainly, I think he can tighten things up. He has a system — it was “the Predator Way” here, so I’m sure it’ll be the “Capital Way” there and he’ll say it so much you’ll get sick of it and lampoon it and eventually it will simply mean “something the team does that I don’t like” even if that thing is the opposite thing of what it meant the year before — and it relies on every player doing very specific things. It’s not, despite what you’ll hear, a trap. It relies on forechecking and has very little room for floating. So the question becomes whether he can get players to buy in to that. PBs: How do you think he’ll manage Ovi’s decided lack of defensive play? Or might Ovi adapt and evolve his game to towards more of a two-way game? 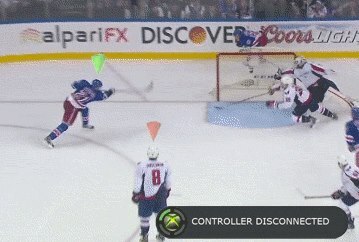 Do you think Ovi can do that? JRL: Caps fans would know better than I whether Ovi can adapt to playing on both ends and despite his generational offensive ability, it’s fair to point out that the guy doesn’t seem terribly interested in defense. We don’t have a great example of a unidirectional player that was able to change when he was introduced to Trotz. Alexander Radulov had his problems with Barry and the system, but he would, on occasion, play defense. J-P Dumont ended up in the doghouse plenty of times for failing to backcheck, but J-P Dumont wasn’t Alex Ovechkin either. This works both ways though. Outside of Radulov, who had success (on the ice) in Nashville, the only offensive superstars Nashville’s had were Paul Kariya (who was exceptional here) and an aging Peter Forsberg. PBs: How do you think he’ll imprint himself and his leadership style on the oft-criticized Caps team culture? JRL: He’s a players’ coach so we’re told, but he’s a demanding guy, too. It’ll be interesting to see how that balances with whatever the deal is in Washington and how much rope he gives the room. PBs: Besides wins, what should we be looking for to assess if Trotz is a good fit with the Caps? JRL: There’s a lot of speculation about his ability to shore up that back end and whether he can make a difference with the blueliners and with the goalies. A success is going to be driving that goals-against number down, which ought to lead to more wins (right?). If Barry’s got the guys on the right page, looking for lower-scoring games, fewer penalties and, if you’re really lucky, a higher PK percentage. PBs: Share one of your favourite Barry Trotz stories or anecdotes. When it came to the host of younger guys he’s playing and having them deal with the likes of the Sedins and Ryan Kesler, Trotz was dead-nuts direct. Saturday night, [Trotz] took a different tact in winning his postgame availability, by just being a dad. Moments after Trotz’ good friend Hitchcock concluded talking, Trotz entered the Nashville media room holding the hand of his son Nolan, a special-needs child. With just one chair at the table in front of the microphone where he delivers his postgame press conference, Trotz asked for another so that Nolan could sit with him after what Trotz deemed a “rough day” for his boy. 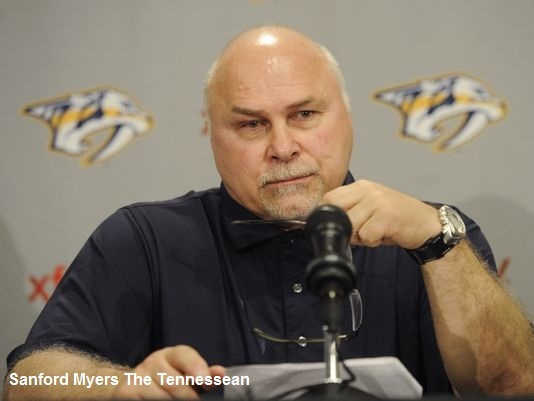 Several minutes into his time, Trotz looked over at young Nolan and pulled his chair toward him. PBs: Give us your Metropolitan Division predictions. JRL: Rangers, Pens, Caps, Flyers, Isles, Devils, Hurricanes. The Jackets don’t matter. Thanks, J.R. and thanks to our pal Johnny Drummond for pointing us to this NHL Network piece on Trotz, “A Coach’s Life,” in which Coach Trotz talks a lot about raising a kid with special needs. It’s a great segment. This entry was posted in Uncategorized and tagged Barry Trotz, Brian MacLellan, GMGMJr. Bookmark the permalink.